These spiced pecans have an addicting balance of salty and sweet, with a hint of spice and a toasty decadent richness that is perfect for the holidays. Seriously though folks, these spiced pecans are so dang good that I’ve made them three different times since their original debut on thanksgiving. Not only are they super tasty, but they’re pretty much made for gifting. I’m not insinuating that any one of you are last minute gifters or anything, buuuut, just in case, here’s an idea for ya. 1. Buy pecans and mason jars. 2. Spend about half hour in the kitchen and another five tying twine to said mason jars. 3. Give out nuts and rake in the complements. 4. Send me a thank you message. 5. Regret giving out nuts because everyone now asks you to make them ALL THE TIME. The amount pictured is about 1/3 of the recipe (because the rest got eaten) so if you give away half-pint mason jars you should be able to fill four or five of them per batch. 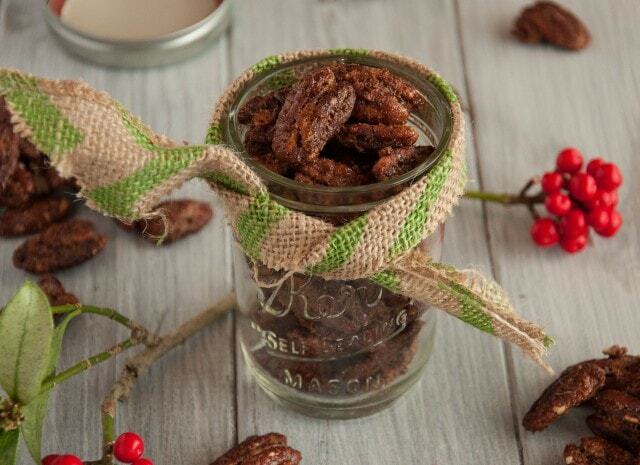 These spiced pecans are as easy as it gets too. It takes about 5 minutes of active time total. You heard me correctly. Only. Five. Minutes. The easiness of this recipe adds to its position as the best holiday recipe ever. If you’re anything like me, you get burnt out of cookies, pies, and extravagantly rich dinners at this point in the season and are more than ready for a mind numbingly easy kitchen task. Well, I’m happy to report that this fits the bill to a T. The most effort needed is a good minute or two of vigorous whisking to get the egg all nice and frothy like. This is essential so don’t skip the frothiness. from Trader Joe’s. They are ridiculously tasty… and also ridiculously expensive. They’ve got a little cayenne kick that may sound weird but it adds a whole nother dimension to the already delicious spiced nut genre. Another awesome thing about this recipe is that I used egg white instead of the butter used by most recipes. Although the butter is awesome because its, umm butter and butter is delicious, I’ve found that it isn’t necessary and the frothy egg white actually gets the sugar mixture to stick to the nuts way better. This being said – make sure to soak the pan immediately after removing the nuts from it because egg whites tend to be rather glue-like. If you’re able to restrain yourself from eating them all in one sitting, these spiced pecans are absolutely to die for on winter salads. I added them to this beet salad a while back and it was almost too much awesome to comprehend. My tastebuds went into overdrive and even now, two months later, I still salivate at the memory. I highly recommend sprinkling a few of these on salads, deserts, or well, anything really. Stir sugar, cayenne pepper, cinnamon, and salt together and set aside. in a separate bowl, combine egg white and water and whisk for about 2 minutes until egg white is frothy. Add pecans to egg white mixture and mix together with your hands to evenly coat the pecans. Move the egg-coated pecans to the bowl with the sugar mixture and toss to coat. Arrange the in a single layer on a baking sheet and roast for 25 - 30 minutes, stirring about half way through. Remove from oven and cool for 5 minutes in the pan before removing pecans.